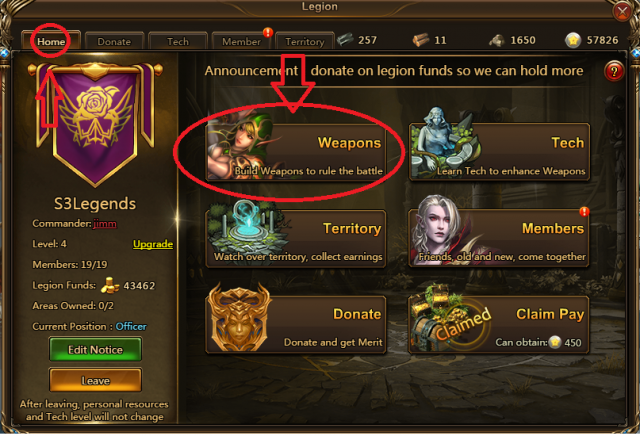 In Eternal War, players can use personal or Legion resources to build powerful Legion Weapons. Weapons will be stored in the Legion Weapon Depot and can be used during battle according to player's Legion status and Tech level. Weapons are highly effective at their roles! Eternal War Weapons can be access here. 1.Shield (magic shield) is used to resist some damage from Eternal War weapons with a base of 5 charges and can be upgraded under player's tech. Shield is mainly used to counter/attack Archer Towers. Without shield an Archer Tower can be killed by any players instantly. Shield is best used by players with High BR, with 4-5 shielded mighty players an Archer Tower is good as dead!! Shield is the cost effective way to get rid of Archer Tower as long as you go in groups of 3-4 players with shield. Note that the shield only works against Eternal War weapons meaning regular player attacks ignores the shield protection you have and can attack you. 2. Battering Ram - when used you transform yourself into a Battering Ram. When transforming into a ram a player needs to be close to the circle spawn point area when you attack a stronghold. Battering Ram can only attack "Walls". Battering Ram can also be use as a decoy for Archer Tower to attack while your allies are busy attacking the Archer Tower. Battering Ram is one of the best weapon that earns lots of merit points! 3. Blast Giant - when use you transform yourself into a Blast Giant that carries a huge bomb ball. While transformed as Blast Giant you have the option to detonate anytime anywhere you wish. Blast Giant is best use for attacking heavily fortified strongholds with lots of Archer Towers. Blast Giant can destroy or damage anything 8 squares around it. a Blast Giant can kill any player/s around it instantly when it detonate!! While Blast Giants are great for offense it can also be use as a great defensive measure. Blast Giants can give lots of merit points depending on the amount of players killed when it detonates. Players can upgrade the tech for Blast Giant to get more merits points when it kills players. Blast Giant is probably the most fun weapon to use in the war! 4. Landmine can be used anywhere inside the stronghold. Landmines can be seen by the same faction and cannot be seen by other factions when in use. Landmines are versatile. It can be use on both offense and defense. Landmine can instantly kill any player's who step into it. It is best to place a Landmine in front of barracks and Archer Tower for defense. A Landmine has 4 hours duration only, so best use during all out war. Low BR can effectively use Landmine to waste High BR players’ time and lower their morale by making them chase you and luring them to the Landmine you've set up. Upgrade Landmine on tech for best result! 5.Archer Tower - can be built inside a stronghold. Mainly use to protect or fortify a stronghold. Archer Tower can kill players without shield instantly. Archer Tower can only fire once every 10 seconds. Archer Tower has 10 base lives and can be upgraded to have more life on tech upgrade. Archer Tower plays a major role in defending a stronghold the more you have them the better! best to place more of them together for best result! Players can block the sides of the Archer Tower that can be attack to protect it. Archer Tower has a long build time of 8 hours per tower and can only last for 4 hours so with that in mind it is not worth using Archer Tower during the peaceful times and not recommended to put up an Archer Tower just to kill dragons. One of the best weapon that gives merits! Best weapon for low BR players that cannot fight other players head on. (Note: Archer Tower base life was reduce from 15life to 10 life) I highly recommend upgrading Archer Tower tech only if you are a Low BR player. 6. Divine Seal - is only used on enemy and neutral Keeps. Without a Divine Seal other factions cannot attack or capture a keep. It can only be built by a Commander and officers of a legion. Divine Seal have a 24hrs build time and gives tons of merits and legion contribution. It can be used as a decoy to make other factions overact to it when built. This is probably the only way to get tons of legion contributions in 1 day or less time. 7. Fireball - can only be use by a Commander of a legion or a General of a faction. Use to target and kill any players with the exception of the Commanders and the General. It can be upgraded on the tech upgrade to kill more than one player per square. A Fireball in the hands of a good General can be deadly and can turn the tides of battle during the war. A General can kill any players using Fireball including the Commanders with the exception of the other Generals of the opposite factions. It can be used to clear the way to make the Blast Giants more effective!! A Commander or a General without a Fireball is like having a gun without a bullet!! Make a Fireball or two for your Commander to use during war times.